The essentials for hosting autumn birthdays and celebrations. Purchase mini pumpkins, writing “Join us for some fall fun” on them with a permanent black marker. Put the rest of the party details on leaf-shaped cut-outs that you can tie to the stems of the pumpkins. Hand deliver the invitations or mail them in small boxes. Another creative idea is to buy packets of pumpkin seeds, write the party details on the each package and mail the packets to guests. Create an autumn atmosphere with bright and brilliant fall colors. Begin by inflating orange, yellow, red and brown balloons with helium. Secure the balloons around the party room, along the front walkway and to trees in the backyard. Set out bales of straw or hay flanked by cornstalks and adorned with large orange and yellow ribbons. Line baskets with colorful napkins and fill them with apples, gourds and small pumpkins before arranging the bountiful baskets around the party area. Also create a couple of comedic scarecrows. Prop them up in the yard and at the front door to welcome guests. Add atmospheric touches, such as autumnal flowers, pine cones and other fall-related items. Cover the party table with a festive cloth and sprinkle on autumnal leaves. Real or paper leaves will do! Make an inflated balloon bouquet in fall colors to use as a centerpiece. Consider tying more fall leaves to the strings. Prepare some games and activities to keep your guests entertained. The following are several suggestions. Paper mache pumpkins: Blow up orange balloons and tear strips of orange, red and yellow tissue paper. Provide small bowls of paper mache paste (or watered down white glue) and have kids wrap the balloons with the tissue paper to create their own pumpkins. Once the creations are finished, allow the pumpkins to dry. Then let the kids draw on funny faces with a permanent black marker. Corn-husking contest: Have players race to husk half a dozen ears of corn while blind-folded. Stuff a scarecrow: Set out two sets of old clothes, asking teams to race to build a scarecrow. 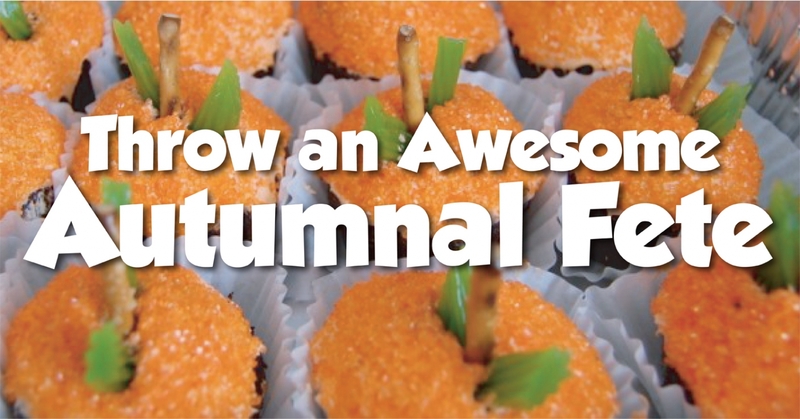 Pie-eating contest: Buy or bake a bunch of mini pumpkin or apple pies before the party. Guests can race to finish their individual pies, maybe without using their hands. Scale down on the mess and possible tummy aches by having celebrants decorate the mini pastries rather than stuffing their faces with them. The choice is yours. Pumpkin greeters: Inflate orange balloons with helium and have kids decorate them with funny faces or fall phrases, such as “Happy Harvest” or “Save a Scarecrow.” Tie off the balloons with string, and then add three or four strips of orange crepe paper streamers. Tie the balloons to the fence, trees, mailbox and other objects in your yard. Pumpkin seed spitting contest: Clean out a few pumpkins, wash and dry the seeds, then see how far the guests can spit them! Caramel apples: Insert popsicle sticks into apples, melt caramels and let guests make their own caramel apples. Harvest races: Play fall racing games, such as having a wheelbarrow, three-legged and potato-sack race. Whether you are hosting an adults-only fete or parents at a children’s affair, consider asking the guests to bring a favorite potluck dish along with recipes to share. Serve hearty soups and some nibbles on the side. Festive light bites include popcorn or kettle corn, candy corn, apple chips, toasted pumpkin seeds and mini cinnamon donuts. Another sweet choice is to serve caramel apples or hollowed out apples filled with peanut butter, raisins and chopped nuts. You can also make a spice cake or get a similar fall treat from the market. Frost the treat with brown-sugar icing and top it with leaf-shaped sprinkles. Just don’t forget the hot cider. Send guests home with fall mementoes like miniature pumpkins, pumpkin-scented candles, decorative gourds, pumpkin seed packets, bags of candy corn, flavored popcorn and caramel apples. Penny Warner of Ballon Time, BalloonTime.com, has more than 25 years of experience as an author and party planner. She has published more than 50 books, including 16 specific to parties. Her latest books include Ladies Night (Polka Dot Press) and How to Host a Killer Party (Signet). Birthday Bliss By Debra Honig-Gold Bringing out the personality in your little person’s party.